There’s a very good chance that you’re reading this issue at one of two conferences. If you’re in Norway, then it may be that you’re at the Underwater Technology Conference (UTC) in Bergen. 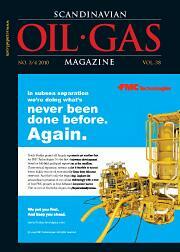 Perhaps you’re in Houston, visiting the Offshore Technology Conference – OTC 2010. If you’re really lucky, you get to visit both conferences. These conferences both take up the issues and challenges of oil and gas exploration in some of the world’s toughest environments. This is not about producing “easy oil”, and the technologies that both conferences address reveal the innovative spirit that drives the industry. And this issue looks at only a few of these issues and challenges. Looking toward the deep waters of Brazil, we hear from Subsea 7 concerning the recently completed pipeline installation activities for the Parque das Conchas (BC-10) development. Continuing with the region, we have look at some of the papers presented last November in Rio de Janeiro during the American Association of Petroleum Geologists (AAPG) International Conference. Finally from Brazil, we hear from Cargotec about the challenges of and its solutions for performing lifting activities in deep waters. Of course, we also include a look at highlights of the upcoming conferences as well. The Norwegian Centre of Expertise (NCE) Subsea fills us in on how the Bergen area cluster has grown to become one of the world’s most complete environments for subsea technology. NCE Subsea has done much to promote the cluster’s activities and will be a focal point at UTC. As part of our pre-UTC coverage, we include a quick look at some of the companies that will help make UTC a memorable event. OTC 2010 promises to be an exciting four days in Houston. Of note will be an additional focus on renewable energy sources offshore, as well as increased floor space for the already huge exhibition. We also take a quick look some of the OTC Spotlight on New Technology winners and their new, innovative, proven technologies. Speaking of subsea innovation, we also hear from Expro about their AX-S™ subsea well intervention system that brings riserless intervention in up to 10,000 feet of water, providing a safer, deeper and more cost-effective alternative to using a rig or conventional wire-through-water intervention system. Bornemann has also contributed to the subsea focus, with an article that explains how multiphase boosting contributes to production improvement and process control. And there are local developments. Wintershall has assigned Norway a hefty chunk of its over €3 billion E&P budget over the next three years. It’s an interesting read to find out why and how. From Société Générale, we have an oil market outlook for the year. What’s the prognosis for the year’s final quarters? How will supply and demand issues affect prices? This outlook provides the answers and more. Did you pick up your Apple iPad yet? Our media columnist takes a look at this super-gadget’s promise. Seems like a really good way to check out www.scandoil.com for the latest news. If you run into one of us at UTC or OTC, be sure to pass on your latest news!